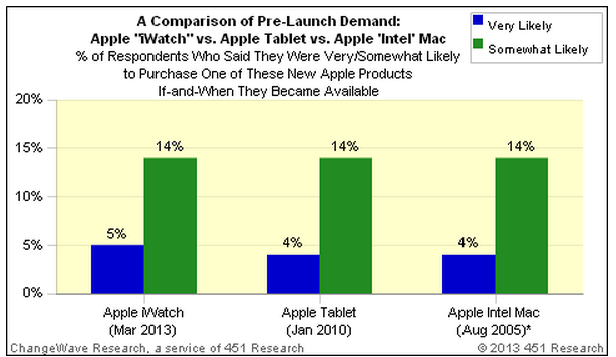 If Apple was to develop a smartwatch, Apple diehards would slap it on their wrist. That may seem like an obvious statement, but now there’s research to back it up. A new study from 451 Research shows what the research firm calls “strong consumer interest” in a rumoured Apple iWatch, particularly among consumers already loyal to the Apple brand. Are smart watches really a smart idea? The rumoured device (Apple has filed a patent, with the image above), as envisioned by analysts and observers, could sync with an iPhone or iPad to handle tasks such as phone calls and texting, and could also include mobile payments, Siri digital assistant and health monitoring sensors. 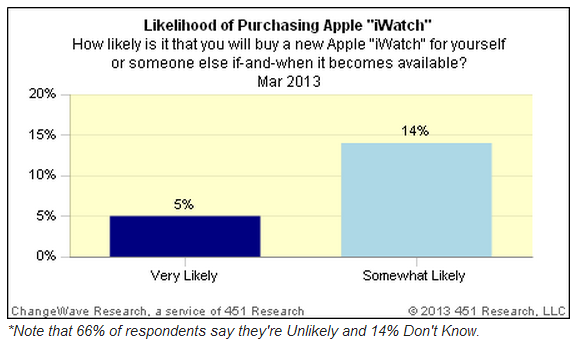 When asked if they’d buy an Apple iWatch if and when one becomes available, five per cent if respondents said it was very likely and 14 per cent somewhat likely. The numbers don’t seem high, but they mirror the interest level recorded before the launch of the Apple iPad tablet in 2010. And when restricted to current Apple product owners, the numbers rise higher, to seven per cent very likely and 18 per cent somewhat likely. While an Apple smartwatch is still speculative, several very real offerings are already on the market, with varying levels of functionality and smartphone integration. There’s the Pebbe, a crowdfunding darling that raised $8 million on Kickstarter to fund its launch, as well as the Motoactv, a fitness-focused tool from Motorola Mobility. Another is the Cookoo Smart Watch, another crowd-funded smartwatch. Several other vendors are also looking at or are entering the space.